Best news of all! Just heard that she’s arrived, and all is well!!! Putting the Internet to some of its best use, this post is not about AUKLET. Rather, it is for anybody sailing in the Pacific, or who might know anybody sailing in the Pacific at the moment, roughly between the Panama Canal and French Polynesia, who might have run across the boat in this photo during the last few months. Shirley, I very much hope that you are about to arrive safe and sound, and that you will forgive that I am taking the liberty of posting this concern for your whereabouts all over the place. It is my great hope that A, it will be completely unnecessary, and B, that if things have become seriously difficult, that all this word might help lead to just the right help. Please feel free to share this around – information moves like a flash nowadays, especially through already established networks. Like ocean sailors. Again, Shirley, I hope that you will forgive this – if nothing else, a LOT more people will be knowing about your blog! Hoping that we will all be hearing of your safe arrival very soon. Has anybody sailing in the Pacific seen this boat in the last three months (since mid-May, 2018)? 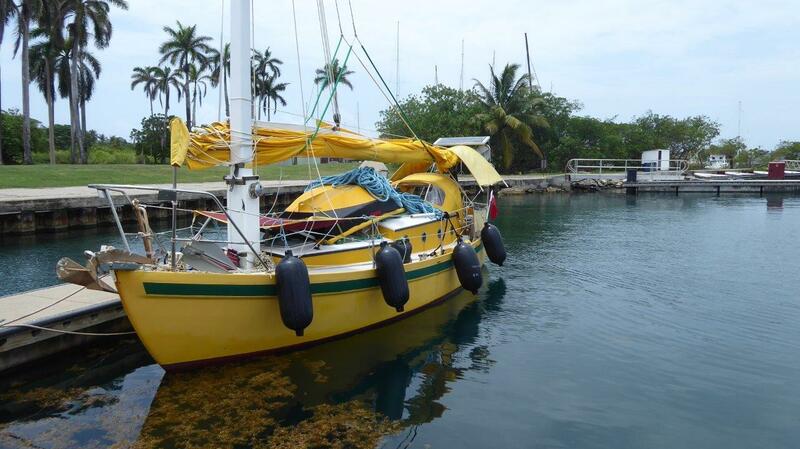 Shirley Carter, on the 25 foot junk rig sailboat Speedwell of Hong Kong, is overdue in her passage from the Islas Perlas, off of the Panama Canal, to the Gambier Islands in French Polynesia. She left from the Islas Perlas around May 10, 2018. Friends and family are concerned, as she expected to make the trip in less than 60 days. Shirley is a very experienced and competent sailor, who has done extensive cruising and living aboard for many years. There is some thought that very light wind in the early part of the passage may have slowed her down considerably, and may have also contributed to bottom growth that could have continued to slow the boat even after she got into the trades. Because Shirley is hearing impaired, she has limitted radio communications aboard. If anybody sees her boat, could you please let us know, and if possible check on her well-being? She carried food and water for 60 days, though will have likely started rationing that when she saw how slowly progress was going. The boat has an engine, but fuel supply was limited. As you can see in the photos, Speedwell is very easy to spot. If anybody has seen this boat in the last couple of months, it would be very helpful to know, even roughly, where that was. Please feel free to copy and paste this post, or to share it from my personal FB page, to any groups with members who might have seen Speedwell and Shirley, or who could be on the lookout in that part of the Pacific. Note that she built a new sail a couple of years ago. 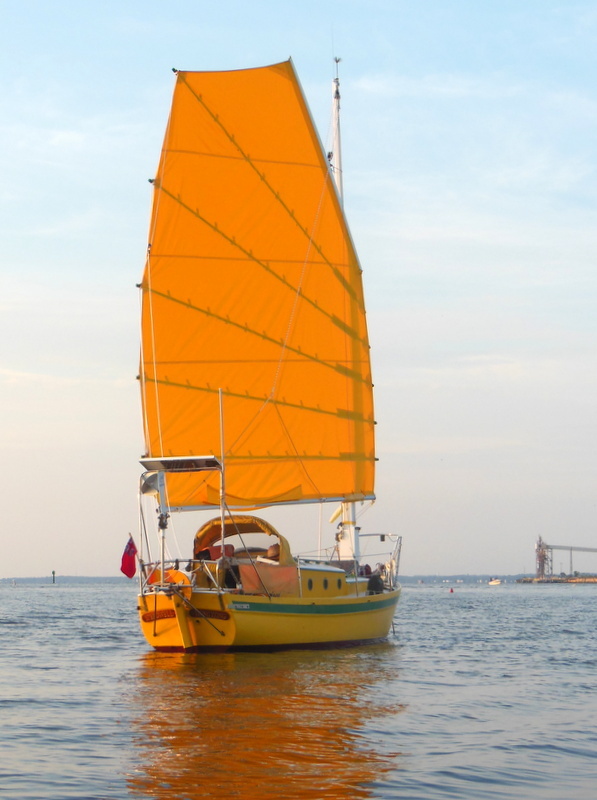 Both the old and the new are bright yellow, but the new one may not have the black image high on the sail that shows in many of her blog photos. Guy, just so you know, the network of Facebook sailors is vast. I shared the above post to the group Women Who Sail, which has over 16,000 members. Many of those members, including quite a few who sail in the Pacific, have now also shared this post to other substantial cruising sailor Facebook groups. Folks will be looking for Shirley, and telling their friends who are in the region, truly worldwide. Hopefully she will forgive me for this – it’s a chance I’m willing to take, in the hopes that somebody will see her boat and offer whatever assistance might be needed. Many messages of good wishes have also come in. Hopefully she’ll be showing up any day now! Speedwell of Hong Kong, April 2018, getting ready to go through the Panama Canal westbound. You’re very welcome – hoping for all the best! Guy and Wendy, I’m sure that you will have heard this already, about Shirley having arrived. Hooray!!! So happy for Shirley, and for your whole family. Best way to start the day!!! Should make for some interesting reading on her blog as to what happened. Shirley, I very much hope that you might forgive all the fuss! So glad to hear that you have arrived and that all is well – looking forward to your next blog post!!! I’ll bet that it’s quite a story. Cheers! Hello, thank you for spreading the good news. I can be reassured too. A French admirer. I’ll pass this along to Annie, who is in touch with Shirley while she’s voyaging. I’m sorry for the sad news.